For the crust: Mix toasted almonds, almond meal, brown sugar, and butter until evenly combined. Set aside. For the batter: Using a stand mixer with paddle attachment, cream goat cheese and cream cheese (both softened to room temperature) with sugar. When smooth, add eggs and yolks, one at a time, until each is incorporated. Blend in vanilla paste, orange zest, and lemon zest. For baking:* Preheat oven to 275° F. Thoroughly spray insides of ten 3-inch ring molds (open at top and bottom) and set on a sprayed baking pan. Evenly distribute and press the almond crust into the bottom of each mold. Add 4 ounces of cake batter to each mold. Bake for 20** minutes or until set. Cool to room temperature and refrigerate until ready to serve. (If not using all the cakes, freeze the remainder for another occasion.) Push cheesecakes from ring molds prior to serving. For plating: Spoon an individual portion of macerated strawberries into a rimmed soup bowl. 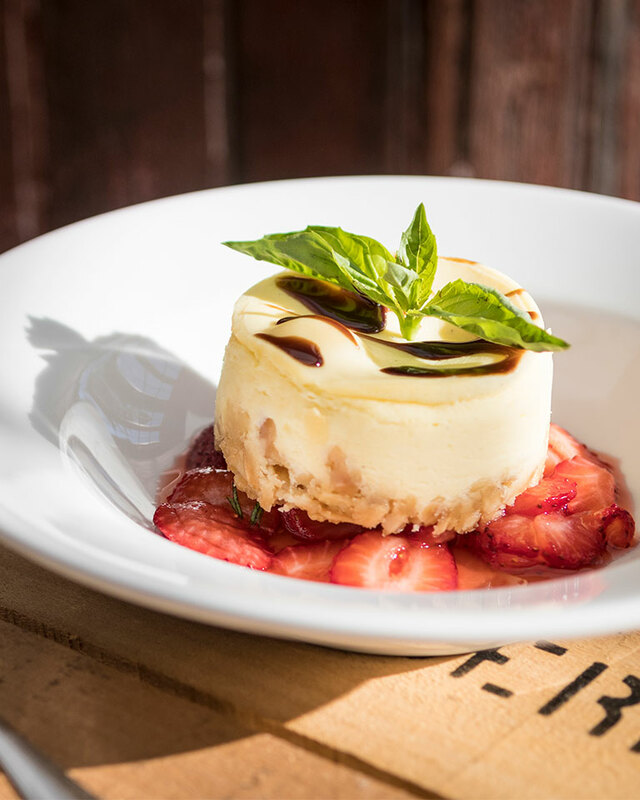 Place a cheesecake at the center and finish with a drizzle of balsamic glaze and a basil sprig. *Alternate baking method: Spray the bottom and sides of an 8-inch or 9-inch springform pan; wrap the outside bottom and sides with aluminum foil. Press crust mixture into the bottom, and pour cheesecake batter over crust. Set pan in a water bath and bake at 275°F for 1 to 1 1/4 hours until set. ** Cool to room temperature and chill thoroughly before slicing and plating as above. **Note: Adjust cooking time to the type of oven being used. *Buy directly from the Amish farm in Fleetwood. A variety of dairy goat products are sold from a self-serve cooler in the creamery. (Note: Bring cash!) Echo Hill Country Store in Fleetwood also stocks Kirchenberg Farm products. Otherwise, use any local goat cheese or a good quality product from a grocer.